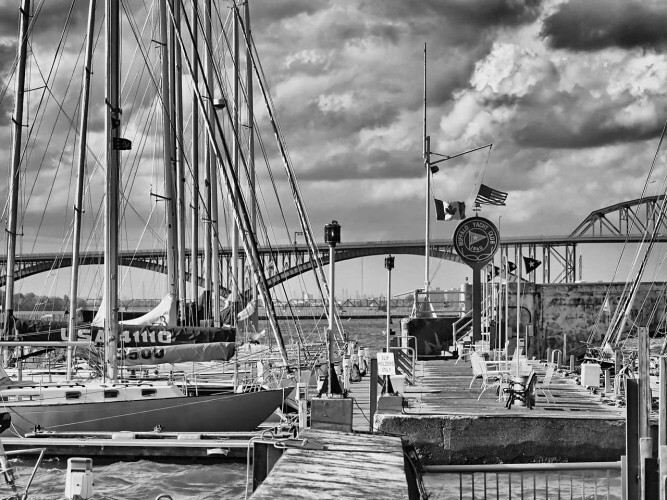 On August 10, 1860, the Buffalo Yacht Club was formed with John S. Newkirk as first commodore. On August 22nd of the year, the first regatta was organized, a tradition carried on to the present time. The first dock facility of the fledgling club was at the Union Elevator property at the foot of Erie Street on the Erie Basin. In 1864 the first of six clubhouses built over the years was erected. Several were located on the Bird Island Pier. By 1893, a new clubhouse, set on piles, was built at the foot of Porter Avenue opposite the new Colonel Ward Pumping Station. The clubhouse was later relocated to its present site, just northwest of the 1893 location. In 1901 Buffalo prepared for the Pan-American Exposition and moorings were made available at the Buffalo Yacht Club for visiting yachtsmen. Regattas, complete with prizes, were set up throughout the summer months and the clubhouse bustled with activity. In 1913, the Yacht Club hosted Commodore Perry's flagship Niagara during the Oliver Hazard Perry Centennial celebrations and the thousands of area citizens visited the ship daily. Perry is honored with a bronze statue located at nearby Front Park. A disastrous fire partially destroyed the clubhouse on November 13, 1951, but club members responded and the building was soon rebuilt. In addition to this fine facility, the Buffalo Yacht Club also has a retreat at Point Abino in Canada, not far from that of the Buffalo Canoe Club and just around the bay from Crystal Beach, the former daily destination of the Canadiana, affectionately called the "Crystal Beach Boat." The Point Abino station has been owned by the Buffalo Yacht Club since 1902 and is not far from the ornate 1917 Point Abino Lighthouse which was erected in honor and memory of the Buffalo Crew of the Lightship 82 which went down with all hands on November 10, 1913 during the Great Lakes storm of the century.